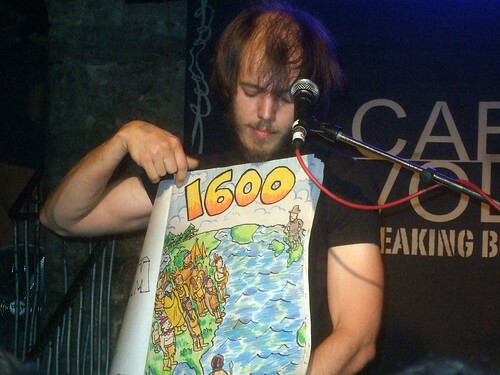 1600, originally uploaded by alister. It's nice to have Edinburgh back after the festival although the post-fringe streets are rather melancholy and rainswept. Amidst the box kickers we made our way to see Jeffrey Lewis and his Junkyard pals at the Cabaret Voltaire. Having seen Jeffrey before I was prepared for his mix of acoustic, electric and flipchart. Like a modern Bob Dylan without acclaim Jeffrey and his band provided a refreshing evening. Video to follow. Hopefully. just dropped by, nice blog.